Place beef and corn starch in a zip top bag; shake bag to evenly coat all of the meat. 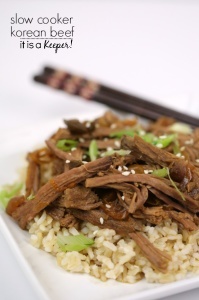 In the bowl of your slow cooker, whisk together beef broth, soy sauce, brown sugar, garlic, sesame oil, rice wine vinegar, ginger and white pepper. Place beef, onions and garlic into slow cooker; stir to combine. Cover and cook on low heat for 5-6 hours or high heat for 3-4 hours. Serve over rice with green onions and sesame seeds as garnish.